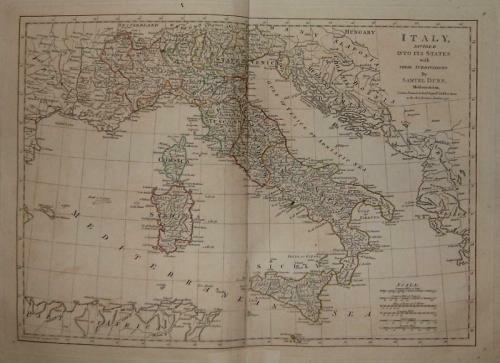 Title: "Italy, Divided Into Its States with Their Subdivisions" engraved by Samuel Dunn, published by Robert Sayer & John Bennett, London, 1774. A handcoloured map by Samuel Dunn, Teacher of mathematical Sciences in London and Member of the Philisophical Society in Philadelphia, in America. Besides being a mapmaker, Dunn was a sometimes publisher of maps and atlases, a mathematician, and a teacher. Dunn's mathematical inclinations are demonstrated on the precision of this fine map. Printed on one side only on good quality paper and in reasonable condition with a small blemish near Naples and a repair to a split in the centrefold.